This decal set varies from the 4 generic version available, it is not as tall as the other 200 hp version availabe. This same decal set with little variation may work also for 135 hp, 140hp, 140 jet, 150 hp, 175 hp ,200 hp engines red and blue color versions. 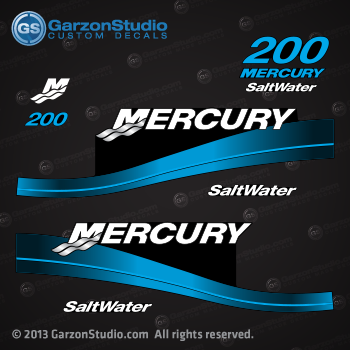 Mercury Outboard decal replica from a 2003 Mercury 200 hp 2.5L SaltWater Carbureted 200 XL CARB SW outboard motor.